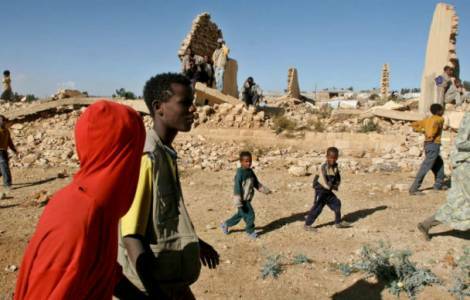 Asmara (Agenzia Fides) - "The step taken by the Ethiopian government is positive and fills our hearts with happiness. Now it is up to Isayas Afeworki to act. He will decide if he really wants to make peace". Therefore some Eritrean Catholic religious comment the willingness of the Government of Ethiopia to cede the disputed territories to Eritrea and put an end to the twenty-year tensions following the war between the two countries (1998-2000). "What we ask ourselves - continue the religious contacted by Agenzia Fides, who ask for anonymity for security reasons - is if peace with Ethiopia is really convenient for Isayas Afeworki. In twenty years he has built his almost absolute power by shaking the specter of the Ethiopian threat and the need to cope with it at all costs". The President postponed the entry into force of the Constitution stating that the security of emergency was not compatible with democracy. He repressed every form of opposition, arguing that the country must remain united. He closed independent newspapers and radios. He created a huge army in which boys are enrolled at 17 years of age. "If he signed peace - the religious continue - he would have no excuse: Isayas should guarantee democracy and the most basic civil rights. Therefore it is necessary to see if he is going to take these steps". The religious dream a country where there is peace: "Ethiopians and Eritreans are brothers - they continue – they have the same origins. They speak languages which come from the same linguistic family (ge'ez). They have the same religious traditions. The same costums and even the same cuisine. They are called to reconciliation and to living together". An agreement would favor the economic development of both countries: "After the war - the religious say - Ethiopia found itself landlocked and the ports of Eritrea remained practically inactive. With peace among the nations, Addis Ababa could use the ports of Massawa and Assab for its exports. Eritrea would have great economic advantage. There would be a prospect and a brighter future than the current one".